This special salad is a nod to my wonderful neighbors who brought the original version to our house for dinner one evening. Three ingredients: Cucumber, avocado, and olive oil. That was it. After one taste of the crunchy, smooth, gorgeously green combination, I was hooked. I have since added thinly sliced sweet onion and grassy parsley because I love how they layer into the salad and provide even greater color contrast. This salad is so pretty, it is perfect for company, but it is so simple that you can make it just for you any time you want. With very few ingredients, each one needs to be able to stand alone in freshness and taste. This is especially true for your olive oil. You want to use an extra virgin olive oil that has a flavor you love because it really comes through when paired with such simple, pure ingredients. Once you taste this salad, it is sure to become a favorite. Go ahead and try it both ways – they are equally spectacular! 1) Peel the cucumber and cut it down the middle lengthwise. Remove the seeds using a small spoon. 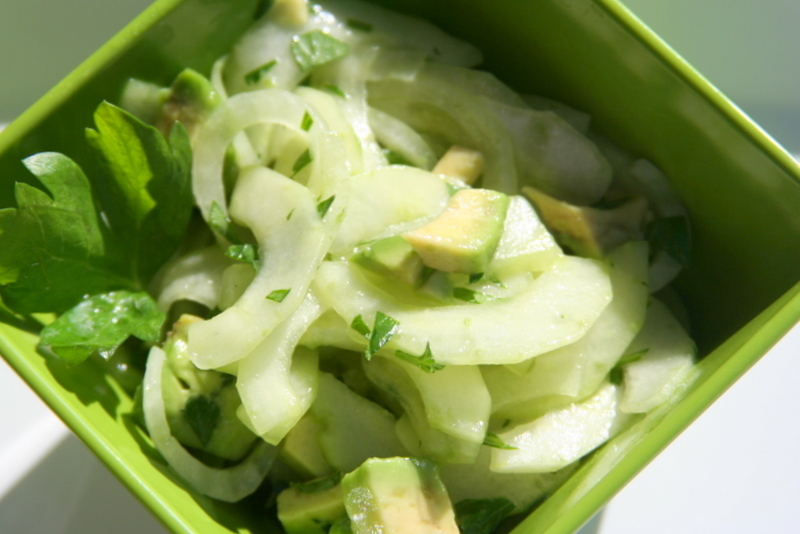 With a mandoline or sharp knife, cut the cucumber crosswise into very thin slices and place in a bowl. 2) Very thinly slice the onion and chop the parsley. Add to the bowl with the cucumber, drizzle the olive oil over the salad, add salt, and toss thoroughly. 3) Cut the avocado in half and scoop out the entire half at once. Place pit side down on a cutting board and slice through the middle (not lengthwise or crosswise – keep the knife parallel to the cutting board). Now cut the avocado into thirds lengthwise, and then crosswise into thin little pieces. Do the same with the second half. Add to the bowl and toss as gently as you can, trying not to mash up the avocado. Taste, add salt if necessary, and enjoy this delightfully simple combination. 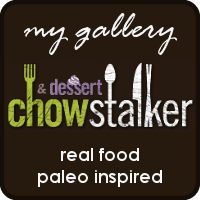 Note: If you’re following a Paleo Auto-Immune Protocal, check out the PhoenixHelix recipe roundtable! Coming up tonight if I don’t eat it first. I find it hard to resist too! Eileen, Thank you so much for inviting me to your roundtable. I’d love to!